While the space shuttle fleet continues its countdown to retirement, Kennedy Space Center teams are already at work to transition the Florida spaceport into the home of the Ares rocket family that promises to carry astronauts to the moon by the end of the next decade. The space shuttle program is facing a September 2010 deadline to complete at least 12 more missions. Two additional flights are also on the books to deliver extra supplies to the international space station if time permits. The shuttle is being retired in favor a new generation of vehicles to haul astronauts and cargo to the space station, the moon and eventually into the solar system. The Ares rocket fleet is a centerpiece of the Constellation program, which also includes the Orion spacecraft that will ferry astronauts to and from the space station and the moon. The Ares 1 rocket will launch the piloted Orion capsule into Earth orbit for both station and lunar missions. Standing more than 300 feet tall, the two-stage rocket will include a modified five-segment solid rocket booster from the shuttle program and a cryogenic upper stage powered by the J-2X engine derived from the Apollo program. 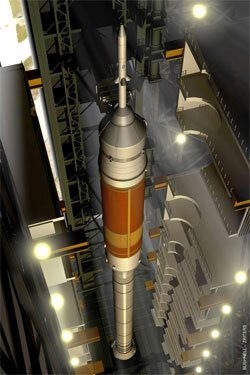 The heavy-lifting Ares 5 rocket is expected to become operational a few years later. The 358-foot-tall rocket will haul cargo into orbit for lunar missions using twin five-segment solid rocket boosters, a large first stage with five RS-68 engines from the Delta 4 rocket program, and an Earth Departure Stage with a single J-2X engine. 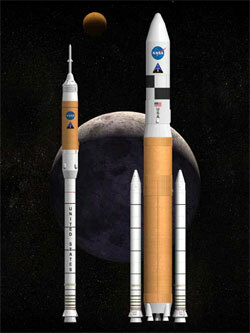 The Ares 5 will be the most powerful rocket ever developed, according to NASA officials. "We've put a lot of energy in these last two years into trying to understand how that transition happens between the fly out of the space shuttle program and the onset of the new Constellation architecture," said Jeff Hanley, Constellation program manager. The first flight of the Orion is on the manifest for September 2012, but budget shortfalls will likely push the first manned launch until 2015 unless more money becomes available soon. Constellation hardware will go through an exhaustive series of tests before the first crewed mission. Preparations for those tests are already underway, Hanley said. 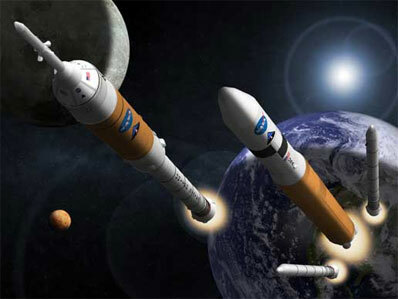 The first highly visible milestone in the development of the Ares rocket fleet is set for less than two years from now. A standard four-segment space shuttle solid rocket booster will launch on a suborbital test flight to gather data on first two minutes of flight for the next-generation rocket. Called Ares 1-X, the April 2009 test launch will feature a simulated fifth segment of the first stage booster and mockups of the upper stage and Orion spacecraft. The rocket will reach an altitude of about 130,000 feet and a velocity of nearly 3,300 miles per hour before exhausting its solid propellant. The first stage booster will then drop away to demonstrate stage separation, an important objective of the $350 million test flight. The first stage will coast to a maximum altitude of 150,000 feet before parachuting into the Atlantic Ocean approximately 144 miles east of the Kennedy Space Center, according to a NASA spokesperson. One of NASA's two solid rocket booster recovery ships will be stationed near the splashdown site to recover the spent motor casing. The stage will be towed back to Cape Canaveral for inspection. The mockup upper stage and spacecraft will not be retrieved after their uncontrolled plummet into the ocean. Construction of the dummy upper stage for the Ares 1-X test launch is underway at NASA's Glenn Research Center in Ohio. 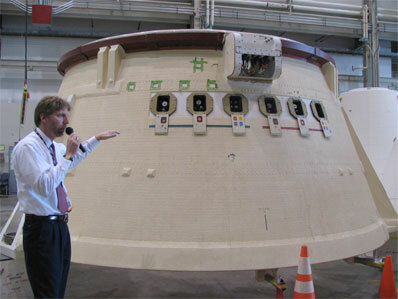 A replica of the Orion capsule is being manufactured at Virginia's Langley Research Center. Transition work to prepare for the demonstration flight has already begun at the Florida launch site. 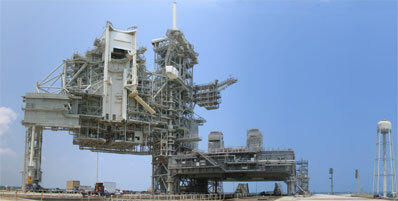 The test launch will blast off from launch pad 39B, the northernmost of the center's two seaside pads currently used by the space shuttle program. Shuttle officials will continue to oversee the facility through much of next year because it is needed to house a rescue shuttle in case space shuttle Atlantis suffers a major problem during a final service call to the Hubble Space Telescope. The mission is scheduled for launch in August 2008. A mission to Hubble cannot reach a safe haven aboard the international space station because the two craft fly in different orbits. A second space shuttle would need to immediately reach a stranded crew in an emergency, and another orbiter cannot be prepared to launch from the same pad in such short order. Despite the shuttle program's continued hold on pad 39B, Constellation program officials are pressing ahead with initial modifications to the complex. "We'll be out here doing work while shuttle is keeping this facility capable for shuttle launches," said Philip Phillips, director of the Constellation project office at KSC. Engineers have designed a series of modifications to the launch pad that will make it ready to host the Ares 1-X rocket within two years. 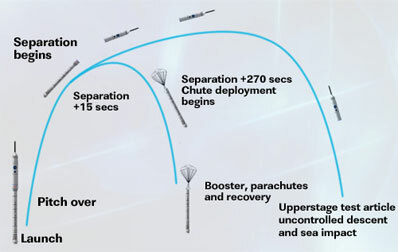 The test launch will require a unique configuration of the complex, which will retain some shuttle elements meant for destruction later in the Constellation program. "The basic premise of what we're doing is taking advantage of what existing infrastructure we have," Phillips said. "We're going to configure it just enough to successfully launch the 1-X mission." For the Ares 1-X mission, workers will make three major changes to pad 39B's structure to access critical components of the rocket before launch, according to Scott Thurston, a senior NASA manager overseeing Kennedy Space Center's transition from shuttle operations to Constellation. "We've designed a plan with the designers to be able to provide access to that vehicle, but providing a minimal amount of modifications at KSC so we can intertwine that with the shuttle program," Thurston said. Thurston said engineers across the agency have been working to provide vehicle access points similar to those used by the shuttle. At the top of the pad's fixed service structure, engineers plan to remove the "beanie cap" from the gaseous oxygen vent arm and replace it with a service platform to reach the Ares 1-X vehicle's interstage area. The rocket's avionics system will be housed inside the first stage's dummy fifth segment, and technicians will need to access the area while the Ares 1-X launcher is at the pad. Officials are still studying several options to reach the avionics, but the current leading candidate is to extend a structure from the hinges for the orbiter access arm used by astronauts when boarding the shuttle. An arm from the shuttle's planned West Coast launch site at Vandenberg Air Force Base could be used as the access structure for Ares 1-X. Vandenberg's Space Launch Complex 6 was planned to be a second home for the shuttle before the pad was mothballed in the 1980's. To reach a safe-and-arm device on the fourth segment of the first stage booster, engineers will use an access point on the rotating service structure. The same location is used to reach the arming mechanism on shuttle solid rocket boosters. Technicians must remove a locking pin in the device before the first stage can be armed. "That will provide us those three levels of access that we need to the Ares 1 rocket for the pad processing," Thurston said. The top of the fixed service structure at pad 39B will also be raised by 100 feet to provide additional lightning protection for the Ares 1-X rocket. "The top of the lightning tower [today] is pretty close to what the top of the Ares 1 in-line vehicle will be," Thurston said. Three new 600-foot-tall lightning masts will also be built inside the perimeter of the oceanfront complex. The massive new lightning protection towers will be a permanent part of the complex for all Ares 1 launches, and construction should begin in the next few months. Officials expect to be able to complete the changes within just a few months between the launch of the Hubble repair flight and the Ares 1-X demonstration mission. "The pad will stay relatively the way it is today, that way we can come in right after the shuttle completes that Hubble launch � then we can come in quickly, do those three modifications, and then come back out and launch Ares 1-X," Thurston said. Components of the Ares 1-X rocket will be assembled in high bay 3 of the 525-foot-tall Vehicle Assembly Building. 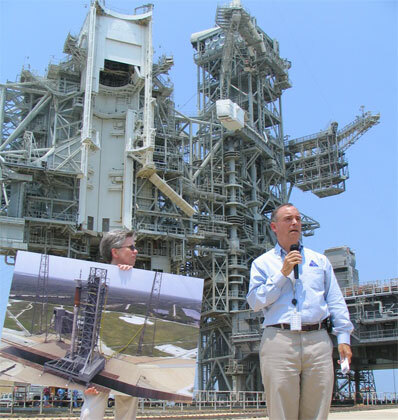 Stacking of the launch vehicle should begin in January 2009, according to Scott Colloredo, senior project integrator for Constellation ground systems at KSC. The test launch will use a modified shuttle mobile launch platform and an Apollo-era crawler-transporter borrowed from the shuttle program, Colloredo said. For the shuttle program, segments are stacked atop each booster alternatively to reduce weight loads on one side of the mobile launch platform. Officials opted to integrate one full booster this summer for October's shuttle mission to demonstrate the new stacking procedure, Phillips said. High bay 3 of the VAB will be used for Ares 1 stacking throughout the Constellation program. High bay 1 will be configured to assemble the larger Ares 5 rocket. High bays 2 and 4 on the west side of the VAB will be used for storage and testing. The countdown for the Ares 1-X launch will be controlled from Firing Room 1 of the Launch Control Center. The countdown nerve center has already been handed over to the Constellation program, and the firing room is undergoing a comprehensive overhaul. Workers just completed removing the vintage shuttle control consoles, and structural changes to the firing room are now underway. The modifications need to be complete by next fall in time to run countdown simulations prior to the Ares 1-X launch. The redesign centers on minimizing the number of people in the firing room and streamlining countdown procedures. Space shuttle launches require the use of two firing rooms -- one for the launch team and another for management officials. Constellation managers want to limit decision-making authority to a single firing room, Phillips said. "The logical push is to make it as lean and mean as it can possibly be," Phillips said. Although the exact personnel requirements for an Ares 1 countdown are not yet identified, Phillips said he expects less than 50 people to be in the firing room for launch. The solid rocket segments destined for flight on the Ares 1-X mission will arrive at KSC from their Utah factory in August 2008. The used rocket segments are manufactured and refurbished by Alliant Techsystems Inc. and shipped by rail to Florida. The segments were originally stacked inside the VAB in late 2004 for use on STS-114, the first post-Columbia return-to-flight mission. After engineers ran into problems with the external tank during pre-launch tests, officials decided to switch to a new tank and set of boosters. Flight rules dictate that solid rocket boosters for space shuttle missions must be launched less than five years after a new batch of propellant is loaded into the segments. The shuttle program will not be able to reuse the booster parts before the five-year service life expires. "There is sufficient test data to show no performance or safety issue of going beyond five years for an unmanned test flight," said Beth Dickey, a NASA spokeswoman. Other hardware components for the Ares 1-X launch are already at KSC, including the avionics set from Lockheed Martin Corp. The package is similar to avionics used by the Atlas 5 rocket, but another design will be used for subsequent Ares 1 missions. The first stage aft skirt, also taken from the original STS-114 booster set, is at the solid rocket Assembly and Refurbishment Facility awaiting final preparations for flight. Small thrusters called booster separation motors will be mounted on the aft skirt to separate the first stage from the upper stage mass simulator. Other thrusters may be added to induce a tumble after the stage is jettisoned. The aft skirt will also contain the hydraulic power units that will control the first stage nozzle to steer the Ares 1-X rocket during the first two minutes of flight. Four hold-down posts will connect the aft skirt to the mobile launch platform. The design is identical to the system used on the space shuttle. "There's a high reliance on heritage design here," said C.J. Smith, the aft assembly lead for Ares 1-X. "It's really what we fly today." Engineers at KSC are also fabricating parachutes for Ares 1 first stage drop tests at Yuma, Ariz. Pilot and drogue chute tests are already underway, and the first main parachute test is scheduled for next month. Main parachute tests will be followed by cluster tests, which will include pilot, drogue and three main parachutes, each measuring 150 feet in diameter. The tests include drops from helicopters and C-130 and C-17 military cargo planes. The Ares 1 first stage chutes are larger than those used by shuttle solid rocket boosters, but the recovery system can still be packed into the same container, according to Daniel Mann, United Space Alliance project manager for the Ares 1 first stage. After the completion of 2009's Ares 1-X launch and the retirement of the shuttle, more significant changes will be in store at the Florida spaceport. 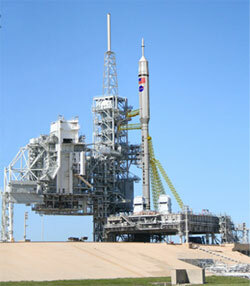 NASA plans to build new mobile launch platforms to replace the aging moveable launch pedestals in use today. The new platforms will include an attached launch tower like the design used in the Apollo program. Although NASA's current crawlers will be used for the Constellation program, they will have to be beefed up to handle the heavy loads of the Ares 5 rocket during rollout, Colloredo said. The fixed service structure and rotating service structure at both Complex 39 launch pads will be demolished, leaving the sites largely bare save for the three towering lightning masts. "Once we get to the permanent configuration, we're taking advantage of some things out at the pad -- obviously the flame trench," Phillips said. "But what we learned from the Apollo guys is they did it right when they were in the VAB and got all their connections done inside the VAB, and all their tests and checkout done inside the VAB." The Ares launch concept is modeled on Saturn 5 rocket processing methods from nearly four decades ago. "When you come to the pad, literally what you're here to do is service the vehicle and get ready for launch," Phillips said. "We're following that same concept under this program." Early plans call for the Ares 1 rocket with the Orion capsule and astronaut crews to blast off from pad 39B. 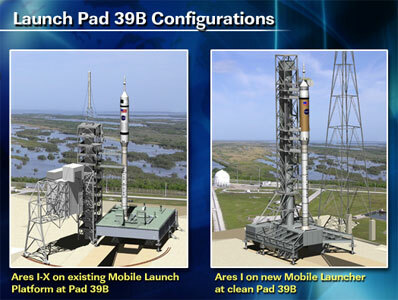 The Ares 5 rocket will call nearby pad 39A home, Phillips said. A new crew escape system will be built to quickly whisk astronauts away from unsafe conditions after an abort late in the countdown. The system will use dual rails and will resemble an amusement park roller coaster. New platforms will be installed in the VAB for vehicle access during stacking and assembly. Stacking of the Ares 1 will be more simplified than the integration of space shuttle components. "This is more clean because it's a slimmer vehicle and it stacks in an in-line configuration where it's just one piece on top of the other," Colloredo said. Work to get ready for the Constellation program is not confined to KSC, and departments across NASA are involved in the transition effort. The transition involves roughly 17,000 civil servant and contractor employees, according to NASA. About 1,500 suppliers, 600 facilities and a million types of hardware are also involved. Engineers, astronauts and other officials at NASA's Johnson Space Center in Houston are overseeing development of the Orion spacecraft. Officials broke ground on a new engine test stand at Mississippi's Stennis Space Center last week to test fire the J-2X upper stage engine for the Ares rocket fleet. The new stand will be able to simulate the very high altitude conditions under which the engine will operate. An existing test stand has already been handed over to the Constellation program for more rudimentary tests of J-2X components, which could begin late this year. Facilities at NASA's Marshall Space Flight Center in Huntsville, Ala., are also being refurbished for development of the J-2X engine. The White Sands Test Facility in New Mexico will be the site for launch abort tests of the Orion capsule's escape tower. The abort system would fly the spacecraft and its crew away from a failing rocket. A vacuum chamber and launch vibration test facility at NASA's Glenn Research Center are also being modified for space environment testing for Orion.